When we think of women’s shoes, we often picture heels. This graceful and elegant footwear is feminine and empowering for some. When you’re shopping for heels though, there’s no one style that suits all. You need to select the right heels for the right occasion and the right heels for you. Some women like to wear heels on a day to day basis, others only bring them out once in a blue moon. Finding the perfect heels that you can wear throughout the day without discomfort is all about taking your time. If your heels are uncomfortable, then you haven’t found the shoes for you. Here’s how to wear different heel heights and find the perfect shoes for you. High heel shoes are measured just as you would imagine. Place your shoes on a flat surface and hold a tape measure against the back of the shoe. From the highest point on the back of the heel to the point where the shoe meets the top of the heel cap is the full height. Measure this and you’ve then found out the size of your heel. Platform heels are measured the exact same way. Shoes usually have a platform when the heel is particularly tall. The added toe platform makes higher heels a little more comfortable to wear by balancing out the incline of the foot. The heel would be the same size if the platform wasn’t there. It should also be noted that depending on your shoe size, sometimes the heel size won’t be exact to the inch. They might be a little bigger than a full inch, or a little smaller. Heels are also almost always measured in inches. Therefore, if you’re looking to convert between inches and cm, it’s worth remembering that one inch is 2.54 cm and 25.4 mm. Check our heel height chart for conversion details. Which Heel Height Is Best? This heel is great for when you need a little lift. It looks feminine but is still extremely practical for everyday wear. A two inch heel will give you a boost, a little spring in your step. However, if you’re on your feet all day, it won’t have the balls of your feet aching. These shoes also have a feminine feel to them. The three-inch heel is what most people would classify as a classic or standard heel height. This height is perfect for the office and casual wear. This is the perfect heel height for after work and weekend activities. 4 inch heels give you a bit of extra height however still look classy. The 4.5 usually has a small platform to provide more comfort when wearing. Although they are fairly high, they shouldn’t give you too much trouble when walking. Designs like the cone or block heel are great for this height as it will provide the balls of your feet with some wide support. The 6-inch heel isn’t for everybody. It’s for people that are very confident wearing heels and have had a little bit of practice. They are gorgeous and most of the time have a toe platform. The toe platform provides more stability and comfort when walking. Can Heel Height Be Adjusted? Heel height can be adjusted however, most heels can only usually be adjusted a few millimetres. If high heels are adjusted too much, or incorrectly, the balance of the shoe will be affected. The main problem that reducing the heel height causes is known as ‘kick under’. Kick under is when the heel of the shoes fold under the shoes a little. This happens because the heel isn’t the size it was made to be for the shoe. If you really want your heel height adjusting, you will need to take the shoes to a cobbler. He can then decide if he thinks the shoes can be adjusted and will still be wearable. 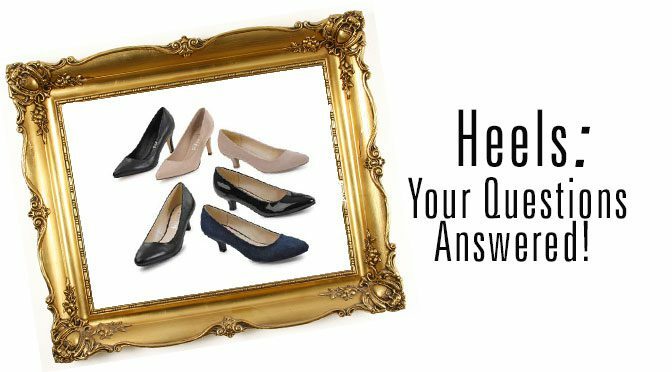 Heels in The Workplace: Are Heels Professional? The right heels can be worn to work and to interviews. In fact, some environments consider heels to be more professional than flats. From 1.5 inch to 4 inches, they’re all suitable for the workplace. This heel height range gives you some height without drawing too much attention. However, when it comes to shoes with 6-inch heels, these may be a little high. These are best kept for fun times with your friends after work or during the weekends, not for running around the office. They’re likely to be impractical in a professional situation. When it comes to interviews 6 inches of heel may be a little too much. But, still, heels are acceptable and can make you appear rather professional while looking stylish. For some, heels help them to feel confident in an interview situation. Although heels are not mandatory. You can still rock an interview with flat ballet shoes on! Are Heels Good for You? When you first start wearing heels, you may have noticed your ankles getting stronger. It is proven that for the first few years you start wearing heels, they strengthen the muscles surrounding the ankle joint. Over time, you will get used to them and they’ll no longer be strengthening your ankles. Although, you can keep doing simple exercises that’ll keep your ankles strong and stretch your feet out, especially after wearing heels. A simple one is to stand on the balls of your feet on a step, with your heels hanging off. Push up on the balls of your feet, so your heels rise, and then lower them back down. There are also things you can do to make your high heeled shoes better for you. The first thing is to find heels that are wider and shorter. We’re not saying you have to stick with the 2 inch heels for the rest of your life. However, 4 inches is certainly better for your feet and back than 6 inches. Also, the wider the heel is, the more support it’ll give to the heel of your feet, which means less pain. Therefore heel types like wedges, stacked heels and block heels are better for your feet than stilettos. If you’re going to a party wearing heels or you’re going to be on your feet all day, take some flats with you. Invest in a pair of flats that will easily fit in your bag. And before you wear your heels outside of the home, wear them in the house, for 15-30 minutes at a time. This gives your body and feet a chance to get used to them while wearing your shoes in a little. Heels can be very comfortable to wear. It’s all about choosing the right ones to suit your feet. There are heels out there that are not super comfortable. However, there are also many different styles of shoes with different shapes. This doesn’t mean that everyone is going to find every shape comfortable, your best friend may find a certain shape or brand the comfiest shoes they’ve ever worn, whereas you might not agree. Finding the perfect heels is all about looking around and trying different brands and shapes. To ensure comfort, make sure the heels you choose are the right size for you. Be sure to shop in the afternoon, when your feet have swelled a little. Then when you’ve been wearing them for some time, they shouldn’t be too painful when your feet swell. Be sure to try your heels on in a Shoe Zone store. This doesn’t mean slip them on for 30 seconds to see if you like them on your feet. It means walking around in them for a few minutes. If they’re hurting your feet, they’re not the shoes for you. Try a different shape or a lower heel. There are lots of different styles of high-heeled shoe, with lots of different designs. Make sure to buy the right shoes for you. The ones that fit you right, that are in the right price range and the ones that you adore!